The objective of digital signage is to get communication results and to add value to the businesses or the organisations. Effective communications is the key to success that professional communicators and managers can no longer ignore. Can increase the productivity of staff. And, digital signage can be less expensive than what you are already using! Explore your alternative and do not let anyone hold you back. Digital Signage Melbourne is a specialist provider of digital signage and integrated technology solutions based in Melbourne. 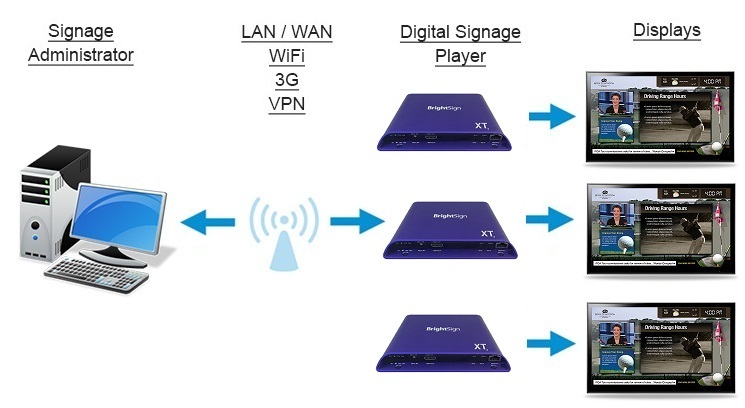 We can help you to connect with your customers using customized digital signage solution. CALL 1300 658 986 to make an appointment now! One of the biggest problems retailers have when it comes to self-promotion is cutting through all of the marketing noise generated by every other business — be it on radio or TV, in newspapers and magazines or from competing store front signs. Digital signage can cut through those distractions by attracting and directing the attention of the most important potential buyers of all — those in a store who are ready to spend money on a purchase. Consider an auto dealership waiting room with customers seated waiting for their cars to be fixed. With well-positioned digital signage messaging — as opposed to an ordinary TV displaying a cable news channel — the dealership can promote special offers aimed at its captive digital signage audience as a reward for choosing to do business with the dealership. Or, in a corporate setting, a digital sign in the lobby can be used to welcome scheduled vendors, guests and other visitors as they arrive — a simple move that builds goodwill. In times of emergency, an existing digital signage network can be a lifesaver, providing critically important messages alerting employees, customers and other guests of exit locations, storm shelters and other vital information. Look for digital signage systems that have the ability to display local alerts instantly by sourcing third-party Emergency Alert Software information, providing instant text alerts as well as coordinated signage that gives up-to-the-second information to all concerned. Preparing a static, printed sign is labor intensive, expensive and time consuming. The same message can be created and displayed far more quickly with a digital sign. Add to that the recurring expense of printing new signs as needs change versus simply updating a digital sign with a few keystrokes, and it doesn’t take long to begin earning a tidy ROI from a digital sign. The other drawback of print is that it is static. Human brains are programmed for motion. Our eyes are automatically drawn to moving objects. Digital signs displaying full-of-motion video are dynamic not static. They tap into something that is innately human to demand attention and hold it. Emails don’t work very well, especially in a production environment. Imagine an industrial plant where management wants to communicate vital information to hundreds of workers: Perhaps it’s production quotas vs. actual performance; perhaps it’s mean time between accidental employee injuries; perhaps it’s delivery information regarding vital components that are en route. In all of these instances — and others too numerous to recount here — digital signage has the ability to convey important information to a workforce that is vital to employees maintaining a safe, efficient environment.